For their first project in three years, these slightly mysterious mood-setters provide musical accompaniment to a restored version of Georges Méliès’ seminal silent 1902 sci-fi flick A Trip to the Moon. It seems like an awfully strange idea on paper: While Méliès’ hugely inventive film, which lasts roughly 15 minutes, is visually dazzling even in its original form and clearly years ahead of its time (MTV diehards might recall its influence on Smashing Pumpkins’ gorgeous “Tonight, Tonight” video), Air have always made a living at sounding downright futuristic—with glowing synth atmospherics and a tendency to push the limits of the recording studio. Perhaps the most logical instrumental backdrop would have been something more classic—something of the orchestral variety, something focused on subtle emotion and simple melody, helping enhance the visuals instead of matching them in intensity. And while there’s a touch of the duo’s trademark moon-glow ambience on display (particularly the haunting piano interlude “Retour sur Terre” and the moody “Décollage”), Air hardly sit back and twiddle their thumbs. In fact, this is some of their most emphatic, headphone-worthy stuff in years. The surging “Seven Stars” (now featuring Beach House vocalist Victoria Legrand in an expanded version) ranks among the group’s finest compositions—building tension with thudding prog-rock tom-toms, a simple piano motif, and a charming space-mission countdown sequence. Meanwhile, “Sonic Armada” is almost laughably funky, journeying through Herbie Hancock-styled synth runs with a dense rhythm section pulsing underneath. 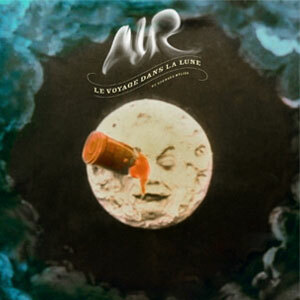 At just over a half-hour in length, the mostly instrumental Le Voyage dans la Lune is far too brief to overstay its welcome, and as a result, every second is impactful. Naysayers might call the album lightweight without the film’s rich visual tapestry—and while that criticism isn’t a stretch, Le Voyage is, given its origins, a small wonder all on its own.